Update to post (December 27, 2006): First, a warm hello to everyone who came here via India FM. Second, please ignore the word "sequel" in this post and mentally replace it with "next installment of the fantastic adventures of Munna and Circuit." 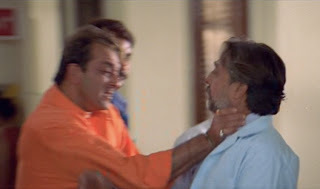 After I wrote this, the comments people sent me prompted me to consider more thoroughly whether Lage Raho Munna Bhai was a sequel or an installment in a serial, and now that I've thought about it further, I'll go with the latter. 1) What the hell happened to his family for the sequel? I'm so confused. Was there an explanation for this 180 in Lage Raho Munna Bhai that I don't remember? Like a quick exchange at the beginning, with Circuit saying "Yaar, it's a real bummer your family was all killed in that fiery autorickshaw crash" and Munna says "Yeah dude, but I'm over it, now that I'm back in the mobster game." I'm almost willing to chalk this up to insuffient subtitling, but the subtitles in LRMB were superb. when it is common knowledge that all women like that are good for is whoring out to shy, upstanding young men so they don't die without having a sexual encounter. - but those I can forgive because Munna is transitioning out of his old ways and is trying to take care of things effectively, and unfortunately these are the ways he knows how. Alright. The rest of it was good fun, as everyone on the planet has already pointed out. Here are some of my favorite of the film's many, many good life lessons. Thank people. Recognize everyone as an individual. Americans are not the only ignorant tourists. But it's good to encounter ignorant tourists sometimes, because then you can trick them into doing (or buying) ridiculous things. Plus you can call them funny names based on their own culture. Question authority, especially on behalf of those who have no voice. Forgiveness is good. Accept apologies when they are heart-felt. The human touch is restorative. Be humble when you're in over your head. Look out for the little ones. Accessorize! Match your phone to your bling when possible. And, of course, when life calls for a song, hop to it! ad question nr 1: LRM was never supposed to be a true sequel, think of it as just another story with the same main characters, like the Laurel/Hardy movies..
ad double standard: that was sort of bugging me too, not that they sent the dancer to Zameer, but that Munna and Circuit were so appalled by fake Chinki´s disco act. But then I so did not like constant giggle girl Gracy Singh, so when slutty Chinki turned up and Munna was cured of her, I was so glad and very much hoped for a new more suitable woman to come in that I totally forgot to be angry. 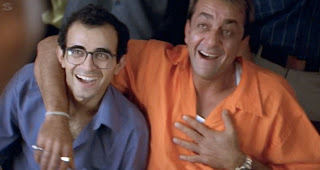 Some very insightful points about Munnabhai. And yes, I was wondering about the family as well! Love you blog by the way :). Great post, and I love the screencaps! Circuit's family disappears in LRM too (wasn't his son called Short Circuit or something like that? :D ). LRM is NOT a sequel, it is the next one in the series...i.e. it will have same main characters but a different story. So, no mention of family from previous film...no parents too, if you noticed. Moreover, the movie was not an out and out moral fest - naturally you cannot condone killing, kidnapping,. etc...but it was mainly meant to be a sattire on the medical system...so it succeeded that way. Re: serial vs. sequel - I'll admit this never occurred to me. I guess that unless I know otherwise, I assume a movie about the same people is a sequel, although obviously I'm familiar with the whole serial concept, with seeing Casino Royale this weekend being a nice recent example. My bad. As for my other issue - I do agree, Aparna and indianoguy, that he was as much surprised as disapproving, if not moreso. I just thought it was poor form to show two women who were behaving largely the same way (although for different reasons, to be sure) being treated so very differently, one condemned (doesn't Circuit say something to the effect of "you don't want to date one like that!"? I can't remember) and one...well, if not condoned, then certainly welcomed. I did notice that Munna didn't seem to be involved in the dancer coming to the hospital, as everyone in his crew is there except him. And it's most decidedly a double standard for Zaheer to be encouraged to be sexual outside of marriage and for fake-Chinki to be abandoned because of her sexuality. This may be a traditional set of beliefs to hold in countless cultures, my own included, but it's still problematic and, well, flawed and hypocritical, for starters, in my opinion. It's not this movie's job to overturn that double standard, but I thought including it here, without commentary on it, was troubling, given how many other examples of positive behavior - kindness, helpfulness, forgiveness, etc. - we see. As for morals, I definitely agree that each person has their own. But I also think that the movie has some clear agendas about this, showing behaviors that are supposed to be better - more helpful, more kind, more sensitive - than others. Munna certainly doesn't always get to model the "better behaviors," either, so it's not as though he as a total package is supposed to be emulated. If there's anything about him we should follow, it's probably his bigger pattern of braving new situations and doing what we think is right. Chinki's morality is an interesting question. Yes, she's a doctor, and therefore respected, but she also propagates a falsehood for a big chunk of the story, and she doesn't get punished for that. You are right Beth - morality questions are tricky. And definitely Zaheer and false-chinki's cases do seem to be double standards here. However, jsut two points here. The first point is, we were seeing the movie from Munna's eyes,and in his eyes, a doctor is supposed to be presented in a certain way...so it is stereotyping, by Munna. Secondly, he never speaks about the 'dancer' woman in a derogatory way later...in fact, he encourages Zaheer to go out with her, so probably, it was all a matter of how he 'expects' women or men from certain professions. The movie, of course, does not raise a question about women behaving 'that' way, because the two girls - chinki and f-chinki have a lot of fun later discussing all about it. LAGE RAHO MUNNABHAI IS NOT A SEQUEL. PERIOD.